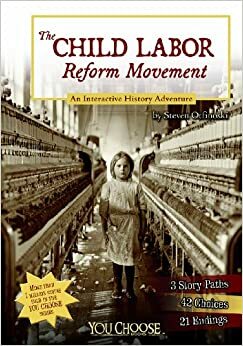 To call this an “adventure,” as the subtitle does, seems awfully odd to me, but Child Labor Reform Movement (An Interactive History Adventure) by Steven Otfinoski does effectively use the elements of interactive fiction by giving the reader choices. Unfortunately, as you might guess from the title, nearly all of the choices end badly, as the book explores the horrible working conditions of children in the workforce during the 1800s. I appreciated the historical, archival photographs sprinkled throughout this book (with three main story paths and 23 different possible endings). The photos, coupled with the stories and narrative choices (we call them branches when my students make their own Interactive Fiction stories) really draws the reader into the experience of a young child living, working and then mostly dying in an unfair system in which children were regularly abused in many ways. That said, the book is very effective in its rhetorical design, and is written for an upper elementary/middle school audience. The reader can “become” a pauper’s apprentice in England, signing away their childhood for awful living conditions; a factory girl in Massachusetts; or a newsie in New York City. The narrative keeps circling back and you realize that no choice is a good choice, because children working in these conditions had no agency or choice, only the need to survive (which many did not). Historical anecdotes and research dot this book, and it makes clear the movement that came along to try to change the way children were used in the work force. Much has changed for the better, at least in First World countries, but a final word from the author notes that, according to a report by the International Labor Organization, there are still about 246 million children working in places around the world. That should open the eyes of young readers. 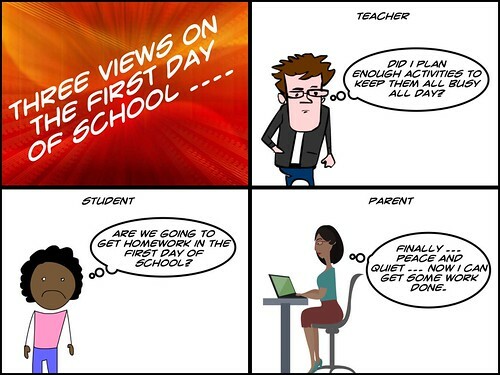 A collaborative writing project that began in early summer in the Connected Learning MOOC has just wrapped up, and it was a blast, as a bunch of us engaged in some story writing with an invented character Miss Direction. 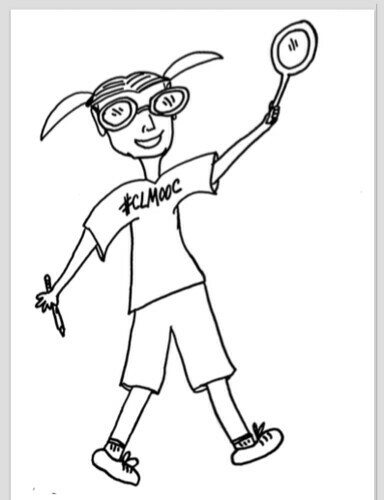 It all began when our CLMOOC friend, Jeannie, remembered a hacked toy from the first year of CLMOOC that she had mailed around to folks for Vine stories. Chalkboard Man disappeared that year, never to be seen again. This year, we used another invented character from Jeannie’s imagination — Miss Direction — and made her out of paper. More than a 16 people from all over the globe downloaded a copy of Miss Direction, took her on an adventure to find Chalkboard Man, and then wrote about it (and documented with images or video) on a shared but secret Padlet space. I have been wanting to do more with iBooks Author, the app on my Mac for publishing, so I took all of the text from the collaboration and created this downloadable book. Each chapter is another writer who hosted Miss Direction. As a bonus, each writer, after finishing their section, was encouraged to mail their version of Miss Direction to the next writer, so she flew through the mail quite a bit in different disguises. 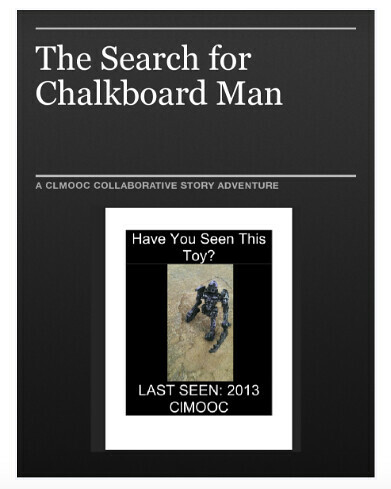 Read and Download The Adventures of Miss Direction: Searching for Chalkboard Man via Scribd. Or you can read it here, via this embed. I am also going to work through how to publish this as an eBook in iTunes as a free story. More later when I figure that out. I love this kind of collaboration that unfolds over time. It’s a bit tricky to do the logistics on this kind of project, particularly where you want the story to remain hidden until the end. Feel free to download your own version of Miss Direction. Color her and send her off on an adventure. Be sure to share, too. I’ve not been as big of a fan of Rick Riordan’s Trials of Apollo series as some of his others but my son still enjoys the read-aloud aspects, so I am full in on reading the series. We just finished The Dark Prophecy, but it took us all summer to read, which is unusual for us. I think what gets me is the voice of Apollo here, as he undergoes his trials as human to learn humility. I do appreciate seeing familiar characters — Thalia Grace, Grover, etc. — and can see how Riordan continues to plant the seeds for future books in the current ones, dipping into other cultural mythologies as he explores the main terrain of Greek and Roman myths. Here, Apollo continues to confront past decisions made when he was God who cared little for his human followers, and as a human now, he must both make amends and depend upon others. His godly powers come and go, and he is beholden to a young girl demi-god who has the power to give him orders he must follow. Meanwhile, his quest to confront and defeat former Emperors as well as grapple with the various powers of prophecies moves the narrative along. 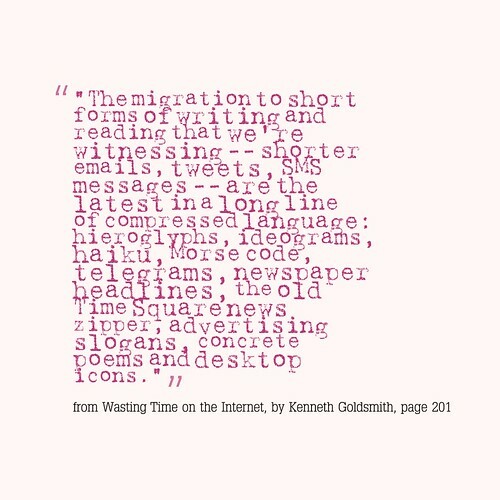 I just finished an interesting examination of digital media, technology, the Internet, and writing by Kenneth Goldsmith. 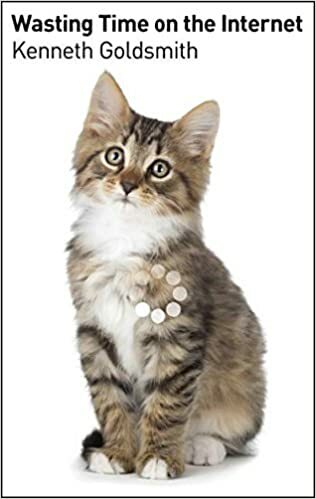 The book has the evocative title of Wasting Time on the Internet, and his premise is that what seems like “wasted time” is often not wasted time after all. In fact, he argues that a whole new way of looking at writing and reading is emerging from our online interactions and creating efforts. I’ve grabbed some quotes from the book that I think are intriguing, as a way to think about Goldsmith’s ideas (the book stems from a college course he taught by the same name). 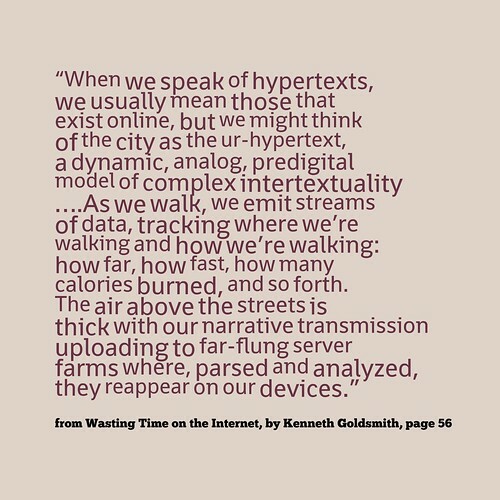 I found this concept of the cityscape as a compositional canvas interesting, particularly when we do think of how our devices give off so much of our data. That ‘story’ is rather invisible to the naked eye, but not to the companies that track us. Isn’t that a narrative shaped by data? The question is, who controls that story? This examination of our web browser as personal memoir stunned me, for all the right reasons. For surely, it is, right? Or at least, it becomes a memoir of our online lives. Can we curate that? Should we curate that? Do we even wonder why our browsers track our history and what becomes of those trails? I wonder, is there a way to shape our browser history into a story or narrative? What would that look like and how would you approach it? 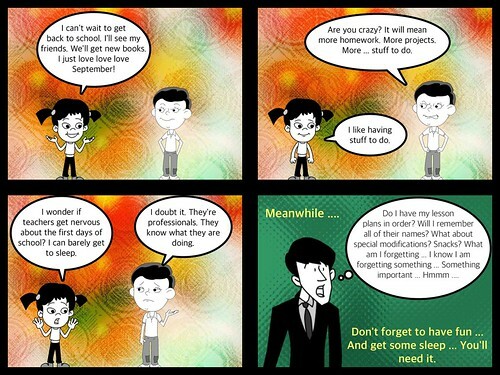 Back to the question of curation. To stem the onslaught of information and data, we have to find better ways of making sense of it all (signal to noise and back again). The “larger vision” is the story we tell of ourselves, now, and how we will remember the story of us, then. 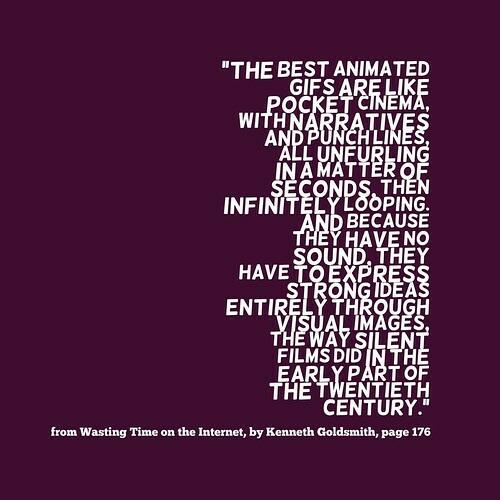 We had just explored animated GIFs in CLMOOC so this section in which Goldsmith dives into the GIF world was interesting. His observation of GIFs as small silent movies, telling a story with gaps in the narrative, set into a looping pattern, expresses much of what we in CLMOOC were exploring, too. How to move the GIF from just funny visual meme into something larger? That’s a worth exploration. Yeah. Imagine that. 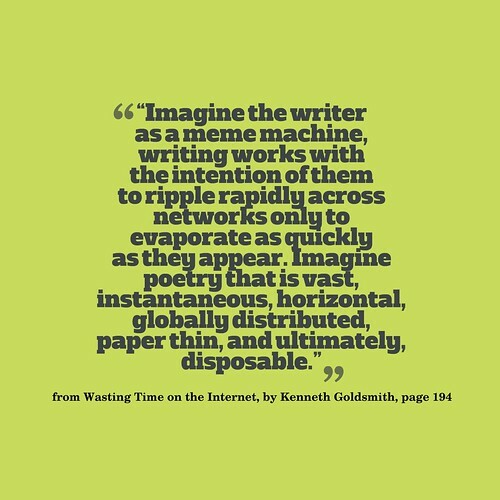 A recent conversation about using Mastodon, where I join others in writing small texts on a regular basis, centered on this “writer as meme machine” because we talked about the disappearing texts. Not as something to mourn but as something to perhaps celebrate for the way they come and go and remain in memory, if not on the page. As a writer of this “short form” writing, every word and every sentence has to have some resonance. 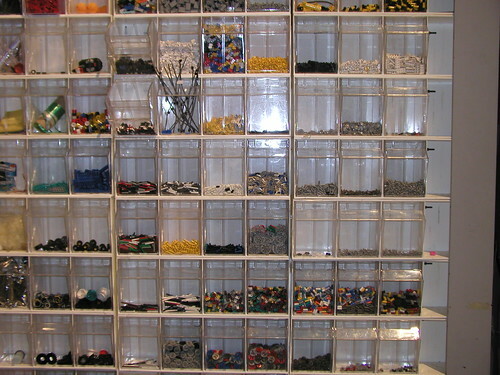 There is no wasted space. And this, too. Nothing new is happening here. Just a new platform. Good to remember. 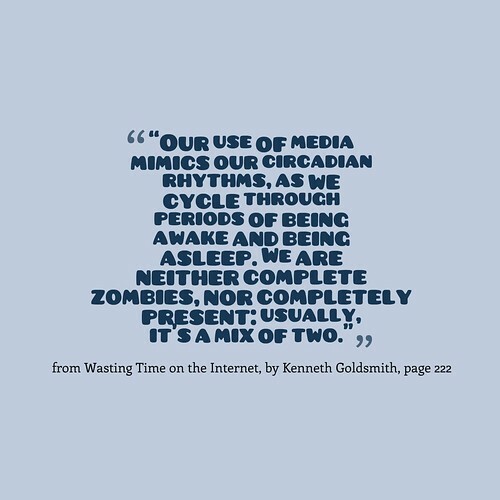 Goldsmith ends his book with a reminder that what seems to be inattention or what seems to be zombie-like connection to the screen may, in fact, be something more, something deeper than appears at first glance. I agree, yet fall back into the “get off that screen” when I see my kids hunched over their iPod or phone. 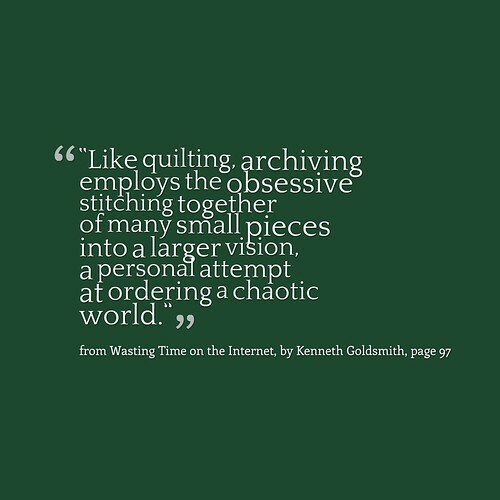 Finally, for the very last chapter of the book, Goldsmith includes a list of 101 Ways to Waste Your Time on the Internet, via a crowdsourcing endeavor with his college students. I pulled some that I thought were worth remembering (I am curating!) and decided to dump them into an app that animates text. Notice how all of the words got mashed together. The app couldn’t handle the flow. The smashing of words was not planned but amusing just the same. It’s been some time since I created new songs with Garageband, but I had a stretch of time yesterday with no car and no family in the house, and I had recently re-loaded GB into my iPad (I had removed it for space reasons at one point). I was immersed myself for about an hour, using loops and other techniques to try to create a groove. 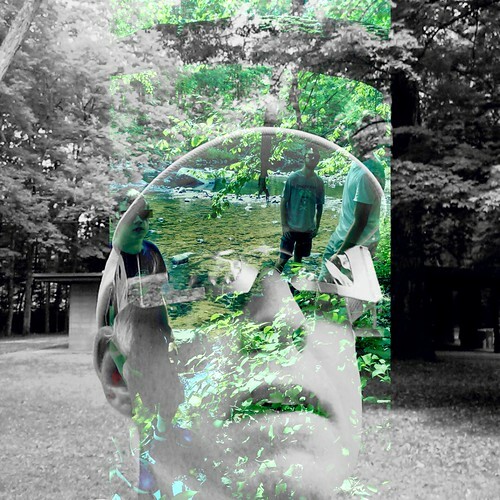 I only used a small bit of filtered voice — saying the title of the song: What they Want Is Not What They Need — and kept tinkering with the lead guitar, the world instruments and that driving drumbox beat until I had something I liked. My son and I were enjoying See You in the Cosmos by Jack Cheng when somewhere towards the second half of the novel about a precocious boy wanting to send his Golden iPod to space on a rocket suddenly took a turn that surprised us both. I won’t give it away, except to say that the book, already enjoyable as a read-aloud, went deeper still as Cheng’s protagonist, Alex, learns more about life than we would have expected. The novel is told mostly in the voice of Alex, an 11-year-old who narrates his world into the voice recorder of the Golden iPod, which he hopes to send into space on a rocket he intends to build, in order to emulate his hero, Carl Sagan (also the name of his dog). References to Carl Sagan (the scientist) and the movie, Contact, abound. Alex hopes whatever life in space finds his iPod will come to understand the Human Race. Meanwhile, listening in, we come to understand Alex, and the constellation of his family (both known and unknown), and the way that time and space fold in on us in strange and unexpected ways. Alex is an innocent but attentive observer of the world. See You in the Cosmos a beautiful book, full of voice and compassion and complexity. You’ll cheer Alex on, and wonder if maybe we, the readers, aren’t the very life forms he is writing to, reading the transcripts of his life, in order to understand the beings on Planet Earth. Our family biked to the local park to watch the partial eclipse, and my wife and I took some photos (not of the sun). 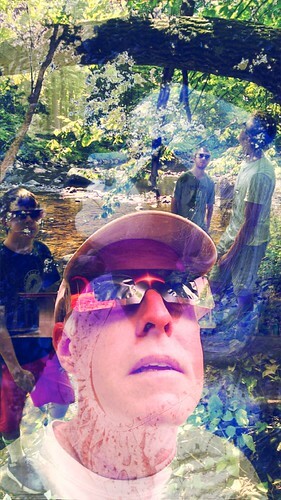 None of the photos had all of us together, so later, I used a few apps (the main one was Fused, which allows you to overlay photos) to try to merge them, and then I admit I had a little too much fun with the effects. I received two reactions from some friends. One notes that it looked like I was starting and advertising a cult worshipping the sky. Another humorously asked, as a reaction to the trippy effects of the image, if marijuana is now legal in my state? (It is, but I don’t partake). Hey .. we just wanted to see the moon overtake the sun for a bit as a family (difficult enough, when you have three teenagers). Hope you stayed safe wherever you were (if you were watching). I stumbled across a video from this group that does interviews, and puts the audio to sketches. Very cool, and interesting from a viewing perspective (never mind the creating perspective — just think of the storyboarding that must go on here). In this video, a fifth grade teacher talks about teaching reading, and the love of reading. I found myself getting lost in her words (in a good way) and I followed the sketchbook artists. What were they trying to complement in her voice with their pictures? That’s what hooked me here. Music. Writing. Art. Love. Resistance. Revolution. 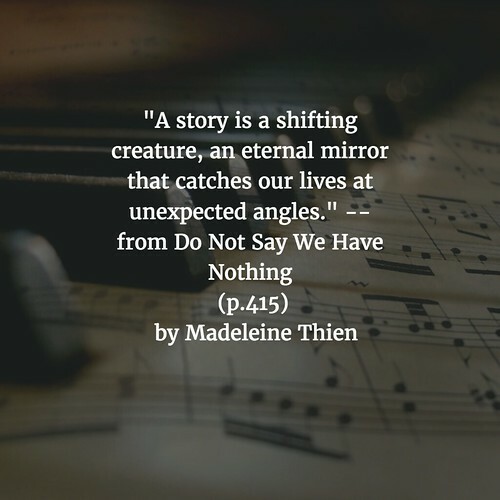 These ideas all swirl around in the majestic novel by Madeleine Thien, Do Not Say We Have Nothing. Set mostly in China during more than one revolution, the novel’s scope is large but its attention to characters and details makes it feel intimate as well. 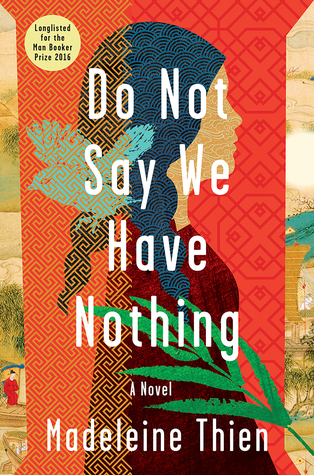 We find ourselves drawn into the lives of one woman trying to find the stories of her relatives, and her own father, through their lives during the Cultural Revolution that uprooted thousands of families and the Tiananmen Square protests that turned violent. Music swirls around the story, as the main characters are composers and musicians, and writers, and the concept of story itself as the central tenet for how we live our lives with meaning and love surfaces over and over again, as it should. I found myself wondering more and more about Chinese society and culture, and how we often lose track of the lives of the people among the news of the politics and economics. So many Chinese families have paid the price for Revolution, for change, in such a relatively short time period, too. Thien reminds us that the role of the novelist is to both peel back the layers of complexity, to show us the stories of people in the midst of that change. Yes, there is much suffering here, but there is also love and family and the desire to rise above your surroundings to create art that means something. There is hope here in Do Not Say We Have Nothing. That’s a powerful message, always. Hope that days of turmoil and uncertaintly will get better, and that art – music and writing — will allow us to be remembered, and not forgotten. One can hope.